Buy Grumpy Mule decaffeinated ground coffee 227g in the UK from our online shop or directly from our independent Scottish store. 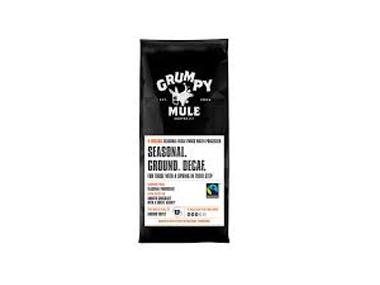 Grumpy Mule organic and fairtrade seasonal decaf coffee. Strength 3 with chocolate and nutty flavours. Grumpy Mule ground coffees are suitable for use in a wide range of coffee brewing equipment including filters, French press (cafetiere), percolators, AeroPress, Chemex and siphons. The Grumpy Mule Organic Seasonal Decaf has been decaffeinated without chemicals, ensuring the best origin traits of the coffee are retained. Roasted a little darker, there are flavours of chocolate with a balancing subtle acidity. A rounded and smooth coffee with a refreshing clean finish. An excellent decaf for all-day drinking, suitable for a range of coffee making equipment. As official Grumpy Mule stockist, we sell genuine Coffee Ground & Beans directly from our shop in Scotland and online throughout the UK. View more products from Grumpy Mule. Where can you buy real Organic Decaffeinated Coffee safely online? If you are wondering where you can buy Grumpy Mule decaffeinated ground coffee 227g safely online in the UK, then shop with us. We are an actual health foods shop; with real people selling real foods and products. Our award-winning independent shop is located in Stirling, Scotland since 1976. You can buy our Organic Coffee and other genuine Coffee Ground & Beans in store or safely place an order with us online or over the phone. Organic Decaffeinated Coffee - Grumpy Mule decaffeinated ground coffee 227g in Coffee Ground & Beans and Drinks.